Not one single Republican voted against. Video of the debate and vote is at CSPAN. In an editorial today, the WaPo said "attempting to strip the agency of its authority to regulate is premature." Credit is given to an "overwhelming number of bloggers in the online science community." Regarding the possible origin of the fraud, the article says, "Some suspicions have arisen about Julisa’s father, Dr. [sic] J.R. Castillo, a local engineer and musician." The commentariat at Reddit have some more specific ideas. A story appearing online Saturday claimed that a Beeville, Texas fourth-grader, Julisa Castillo, had been "named junior division champion for the 2010 National Science Fair" for a project called "Disproving Global Warming". This was immediately spread uncritically around the climate-denial echosphere and featured prominently at climate swift-boat headquarters, Climate Depot. Currently, a Google search of "julisa castillo" + "science fair" yields 399 hits. Unfortunately for the denial-mongers the entire story was a hoax. Blogger Michael Tobis of Only In It For the Gold yesterday drove the 3 hours to Beeville to investigate for himself. MT found that the letter purporting to be from an L.L. Slakey at the National Science Foundation announcing the award had several very troubling aspects (details here). Furthermore, the National Science Foundation does not sponsor a "National Science Fair". Although there is an Intel International Science and Engineering Fair, it is aimed at students in grades 9-12. Upon inquiry from MT, the NSF responded, "The letter is not authentic, Linda [Slakey] had no knowledge of it, and it amounts to fraudulent use of our name and logo." The NSF has referred the matter to its Office of Inspector General for investigation. 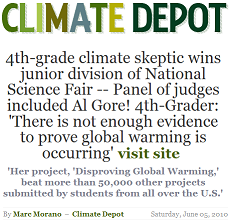 Although Climate Depot has posted an update ("4th-Grade Skeptical Climate Science 'winner' revealed as hoax! "), as of now the Google search "julisa castillo" + "science fair" + correction has only 3 hits, none of which are actual corrections.